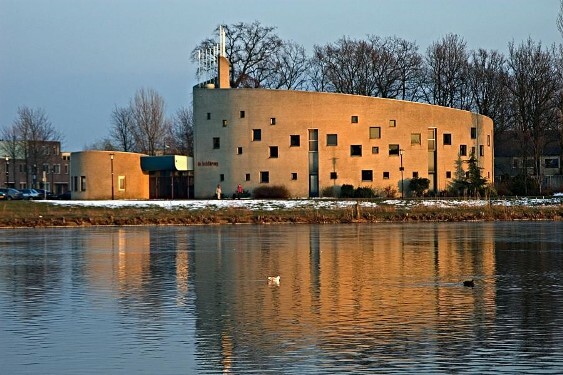 In the 1990’s a remarkable new section of town was built at the north side of Amersfoort, the Netherlands: Kattenbroek. Chief designer is the urban development architect Ashok Bhalotra. He calls himself a traveller who finds his inspiration in images, colours, smells and the work of thinkers, poets and artists of all kinds of cultures, while striving for a harmonious combination of cultures. In this part of town he wanted to create an imaginative composition of atmospheres, as ‘people need stories, memories, expectations and imaginations in order to survive.’ He chose the themes ‘travel’ and ‘being at home’ as key elements in the design and allowed room for an extensive variation in building styles, forms and colours. The circle plays an important part in the design, which has been an important element in city plans for centuries. He sees it as a symbol for the cosmos, the cyclic character of existence, security and community. 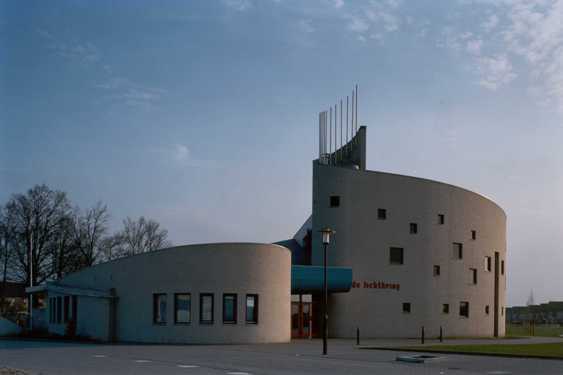 He designed The Ring as a landmark for the residents, a circular road in the centre of Kattenbroek. The Ring is cut through by the straight road, Laan der Hoven, which carries on till the curved line of another road, Het Masker, at the edge of the district. If you leave this section of town via one of these last two roads, you have a view of a big pond with at the other side a building that, just like the pond, follows the curve of Het Masker. It is the church building of the Reformed Church (Liberated) called The Circle of Light (De lichtkring). It echoes the circular forms of the area. Bhalotra calls it ‘a poem’ that expresses its very own meaning. This meaning, however, may not be immediately evident. On the contrary, the building has something enigmatic: the round form very gradually ascends in an upward spiral ending in twelve scaffolding beams, as if the construction is still going on. This spiral form is unusual in building, as well as the impression that the building is unfinished. 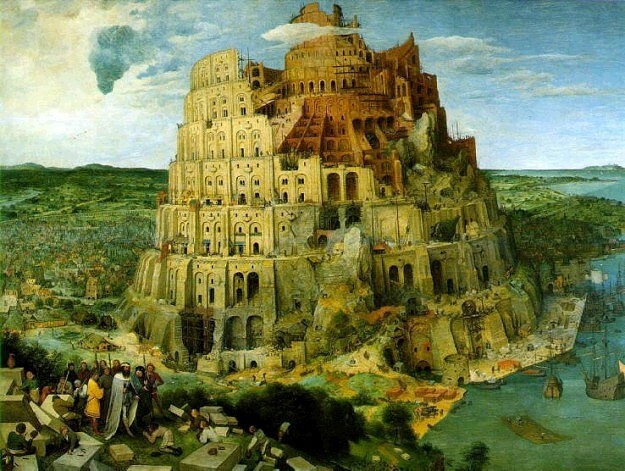 There is an image that many will associate with this particular form: the famous Pieter Breughel painting of the tower of Babel. That tower was a ziggurat, a Mesopotamian temple. In the Bible the building of this tower is described as an attempt to realize the literally sky-high ambition of humankind: to reach the heavens by their own merit and be equal to God. God himself thwarted the completion. 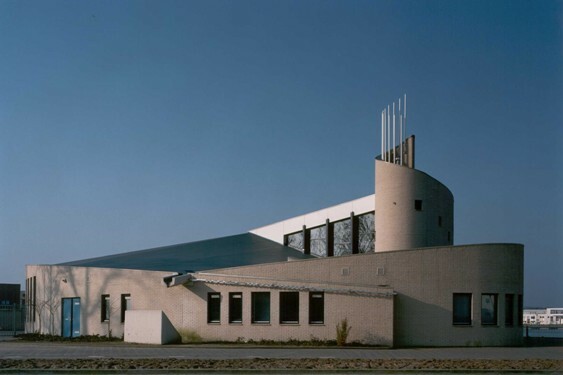 The congregation of De Lichtkring wanted a building that would carry specific symbolic meaning. It found an architect, the late Aart de Ruiter, who shared their faith and convictions. Often a church building is seen as a Domus Dei, the sacred house where God is present in special ways. But this congregation, standing in the Reformed tradition, has a different view. It is not the building that is the house where God lives. In contrast to the Old Testament, where God commissioned a temple in Jerusalem to live among his people, after the coming of Christ he no longer connects himself to one particular place. Now the congregation is the temple of God, as he lives in the hearts of the believers. That is what De Lichtkring symbolizes: the congregation as the house of God. And by evoking the association with the tower of Babel while at the same time deviating from its construction, something else is being shown: that the building of this house is not the result of human endeavour. The very gradual upward movement of the spiral by no means reaches as high as the tower of Babel, as it is not meant as a symbol of ambition but rather of dependence on God and orientation towards him. The scaffolding beams, while making clear that the house is not yet finished, also point to heaven like the more common church tower. They demonstrate confidence in the divine Builder who will continue the work and eventually complete it. A lichtkring is a circle within which light is disseminated. Anyone entering the building, having seen the many small windows in the outer wall, will be surprised about the exuberance of light within the church. Through those little windows an abundance of light flows in, since the small openings in the thick walls widen themselves from the outside in. In this the architect seems to have been inspired by the chapel by Le Corbusier in Ronchamps. The glass wall between the church hall and the foyer contributes to the light atmosphere, just as the light walls and the bright blue-green of the woodwork. When the sun shines, a festival of coloured lights occurs, since colourful works of art have been placed in front of a number of the small windows. 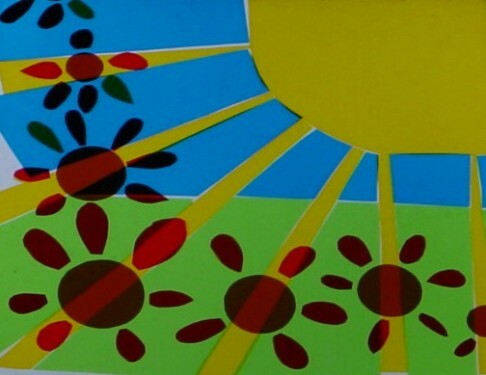 Older and younger members of the congregation have depicted the fruits of the Spirit on them, such as faithfulness, love, joy and kindness. 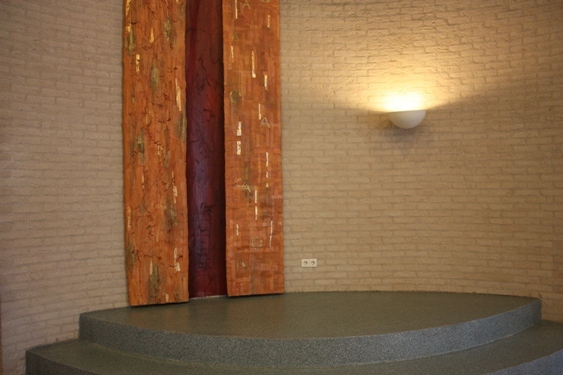 In the foyer hangs a work of art made by female members of the church. 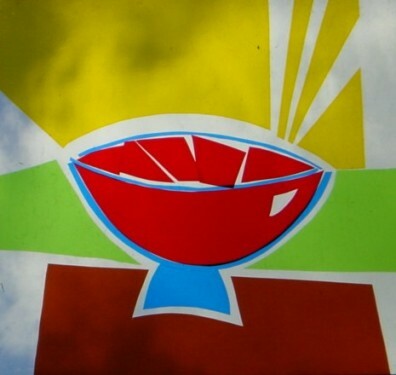 This work also symbolizes that God reveals himself in creation, through Christ and in his Word. Everywhere in the building whole and half circles return: in the pulpit and the baptismal font (with the words ‘In the name of the Father and the Son and the Holy Spirit’), in the two platforms and in the alcoves behind the pulpit and the artwork. This articulates that all belong together in the circle of light. But also outside, in front of the red doors, a circular form has been made in the pavement inviting everyone to enter the circle. And the windows, as small as they are, remind us of medieval pigeon houses where birds freely flew in and out. Ida Slump-Schoonhoven is coördinator of ForumC-Kunst and the Rookmaakerkring. 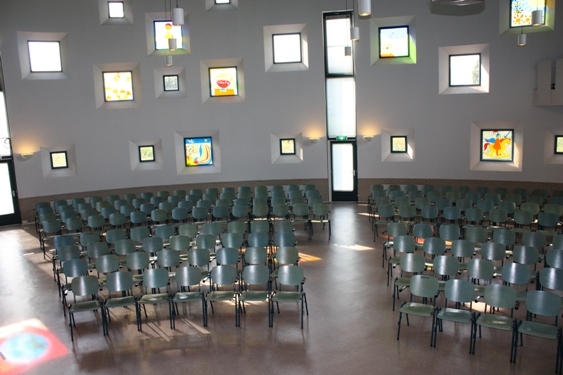 The latter website has more information about the church (in Dutch).